A few weeks back, the humans of planet Earth worked themselves into a frenzy over the possibility that the Kepler space telescope had discovered an alien megastructure. Since then, the astronomers behind the hubbub have had their heads down, hunting for the technobabble that might lend credence to the wild theory. Surprise! They haven’t found it. In case you’ve missed the extraterrestrial hullabaloo, here’s the gist. A few months ago, citizen scientists trawling through data collected by NASA’s Kepler mission noticed something weird: a star that flickers aperiodically, its light output sometimes dipping by as much as 20%. While many stars will dim at regular intervals due to the transit of orbiting planets—and indeed, that’s exactly the sort of thing the Kepler mission was built to detect— KIC 8462852, recently dubbed “Tabby’s Star,” was like nothing we’d ever seen before. Dips in KIC 846285’s brightness over a 1500 day observational period. The bottom two panels are blown-up versions of the top one centered around day 800 and 1500. Image via Boyajian et al. Okay, Neil, that sounds like some sage wisdom there, but goddamnit, aliens! SETI astronomers started the rumor! Now, public excitement has prompted them to follow up on it using the Allen Telescope Array located in the Cascade Mountains. For the past two weeks, the ATA—consisting of 42 six meters antenna— has been trained on KIC 8462852, hunting for the radio signals that could end our cosmic loneliness once and for all. These include narrow band emissions on the order of 1Hz; the sort of “hailing signal” a civilization might send out if it wanted to announce its presence. SETI has also been hunting for broadband signals, which could be the result of beamed propulsion within the star system. If high powered spacecraft were zipping back and forth polishing the Death Star’s primary laser, this is the sort of radio leakage we might expect to find. 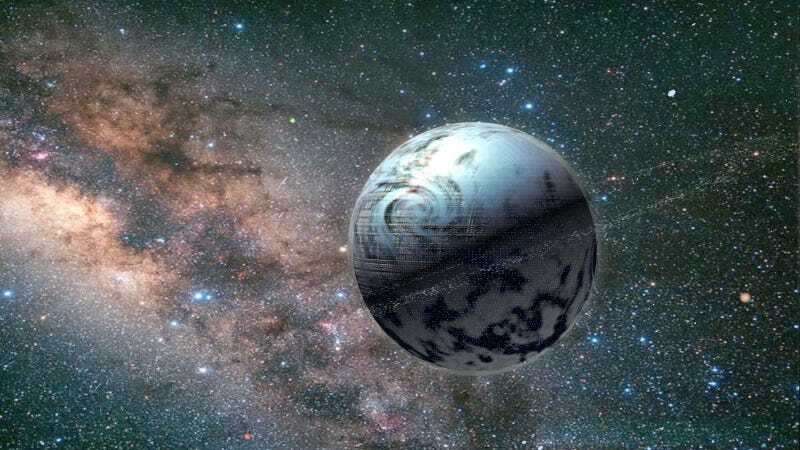 Alas, it is with a heavy heart that I bear this news: SETI has found no evidence of Galactic Empires, Borg Cubes, Forerunner Rings, or any other alien real estate projects human imaginations have dreamt up these past few weeks. That is, astronomers haven’t turned up any promising signals between the 1 and 10 GHz frequency range. This rules out large omnidirectional transmitters, those of approximately 100 times humanity’s total terrestrial energy use in the case of narrowband, and 10 million times our energy use in the case of broadband. These may sound like enormously high limits, but SETI reminds us that any society able to build a Dyson swarm would have access to inconceivably vast amounts of energy; approaching 10^27 Watts. Even if they’re only using a teensy tiny fraction of this energy for signaling, it would still be detectable. You’ll never know until you look. But now that we have, onwards and upwards to the next splashy, scientifically dubious and unsubstantiated theory! Did I hear somebody spotted a parallel universe this week?